On April 12, 1862-one year to the day after Confederate guns opened on Fort Sumter and started the Civil War-a tall, mysterious smuggler and self-appointed Union spy named James J. Andrews and nineteen infantry volunteers infiltrated north Georgia and stole a steam engine called the General. Racing northward at speeds approaching sixty miles an hour, cutting telegraph lines and destroying track along the way, Andrews planned to open East Tennessee to the Union army, cutting off men and matériel from the Confederate forces in Virginia. If they succeeded, Andrews and his raiders could change the course of the war. But the General's young conductor, William A. Fuller, chased the stolen train first on foot, then by handcar, and finally aboard another engine, the Texas. 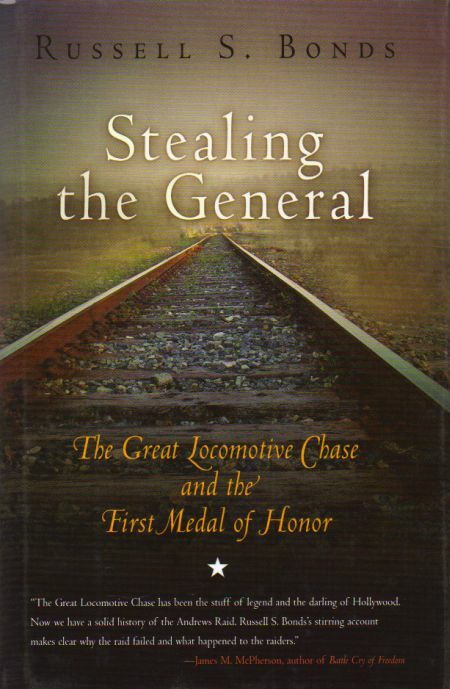 He pursued the General until, running out of wood and water, Andrews and his men abandoned the doomed locomotive, ending the adventure that would soon be famous as The Great Locomotive Chase. But the ordeal of the soldiers involved was just beginning. In the days that followed, the "engine thieves" were hunted down and captured. Eight were tried and executed as spies, including Andrews. Eight others made a daring escape to freedom, including two assisted by a network of slaves and Union sympathizers. For their actions, before a personal audience with President Abraham Lincoln, six of the raiders became the first men in American history to be awarded the Medal of Honor-the nation's highest decoration for gallantry.